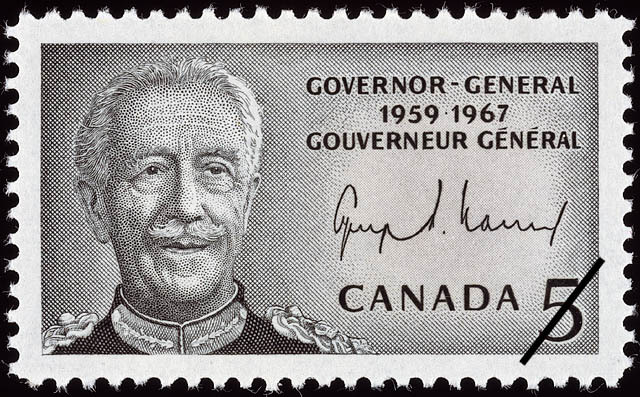 The value of a Georges Philias Vanier, Governor-General, 1959-1967 - 5 cents 1967 stamp depends on several factors such as quality and wear, supply and demand, rarity, finish and more. Values in the section are based on the market, trends, auctions and recognized books, publications and catalogs. This section also includes information on errors and varieties and characteristics. With this commemorative stamp the Canada Post Office payed tribute to General the Right Honourable Georges Philias Vanier, the first native-born Canadian whose death occurred while serving his country as Governor General. General Vanier died on March 5 1957, thus ending the distinguished career of a soldier, diplomat and statesman whose culminating responsibilities were those of the Sovereigns' representative in Canada. He assumed office as Governor General on September 15, 1959. Born in Montréal, P.Q. on April 23, 1888, the late Governor General was the son of Philias Vanier and Margaret Maloney, both of Montréal; educated at Loyala College, and Laval University (B.A. 1906 LL.B. 1911) he was called to the Bar in 1911. On the September 29, 1921 he married Pauline Archer whose warmth and friendliness complemented her husband's dedicated occupancy of the Vice-Regal role. Assuming the office of Governor General, General Vanier said, in part: If Canada is to attain the greatness worthy of it, each of us must say I ask only to serve. General Vanier was severely wounded while on active service during the years 1915-1918 and his gallantry in action won for him the M.C. with Bar, the D.S.O. and the 1915 Star. During the years 1925-28 he commanded the Royal 22nd Regiment at the Citadel, Québec. In 1917 he was created Chevalier of the Legion of Honour; Commander, Legion of Merit (U.S.) 1946; Knight of Justice of the Order of St. John of Jerusalem, 1959, and Knight Grand Cross of Magistral Grace of the Order of Malta, 1959. In the area of diplomacy, General Vanier had an equally distinguished career. He represented his country on many occasions prior to his retirement from the Diplomatic Service in 1953 at which time he had just completed 9 years as Canadian Ambassador to France; he had previously served as Canadian Minister to France from 1939 to 1940.